i have been trying to revive my blogdrive (drive to update my blog, that is). unfortunately, i always seem to be behind with work that all i can do when i get home is watch a movie (to clear my mind), drink (to manage my stress) or worse, work some more. at any rate i decided i would update my blog by posting pics of myself (i'm not vain, really - i'm not) in stockholm where i am at the moment. that way i don't really have to think about what i am going to say. 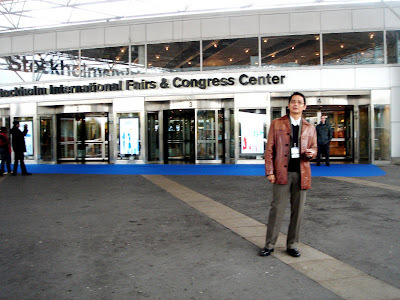 strutting my stuff in front of the stockholm international fairs and congress center, in the hope that the hot janitor would notice me (he didn't). if you want to see pictures of stockholm without my eager mug blocking the way, scroll down and wait for the slide show to load. but hey, winter came early in sweden. it so happened i cannot stay in the nordic countries for an extended period of time because the wet, drab and grey weather gets to me. so if this post blows, blame it on climate change. 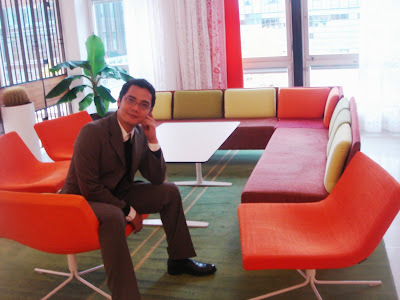 i'm sorry but i will never find those kinds of furnitures comfortable -- ever. i'm glad you found a little time/drive for us. kiel! it has been very long. nasa Sweden ka pala. alam ko na ano pwede mo ipasalubong sa akin dahil andyan ka. since may kopya na ako ng Reason 4 ng Propellerhead, Record na lang. hahaha. loko lang. tama ka, indi kelangan words lahat sa blog. kaya maglagay ka rin pichurs. tulad dito sa crisis. hahaha. nag plug pa, no? so kelan tayo magkikita nyan ulit? it's nice in sweden, no? 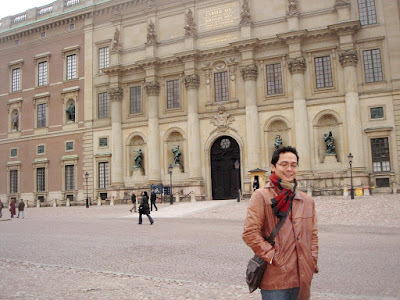 i was there a year ago but only get to visit malmoe. 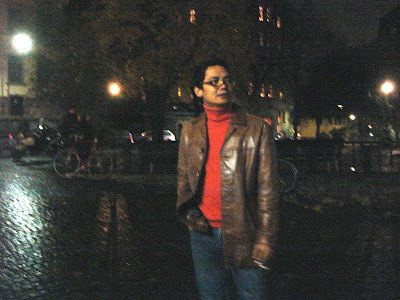 it was autumn then and it's very very very cold. @ lof - i think they were nit meant to be comfortable, really. ok na yun - basta pretty. @ boying - balik ako oct 31. nawala celfone ko. ang bago kong number eh 090888445675. txt mo ako sa 31? @ kawadjan - i decided i will not do a jumping shot until DP kiel becomes a reality. mwahahaha. @ scheez - txt mo rin ako. kta ttayo nila boying. @ john - ok lang namn yung cold sa akin. yung grey drab damp everywhere ang medto dreary. tingnan mo ang binigay mo sa amin na number. 12 digits! pero pag nabigay mo na ang tama na number text ka namin. hee hee. @ boying - ooops! tanggalin mo lang ang isang 4.
glad too see a new post from you. @ g - talaga?! even sans the jumping shot? @ echo - kurek. ang sharp talaga ng lola ko. @ chers - i know! mwahahaha. Kiel! Nagtitext ako sa iyo. Mali ata number. Haha. Anyway, may number ako sa blog ko. Dun banda sa "Contact". Hehehe. Antay ko na lang text mo. LOL. hi. just visited your blog. i find it quite perky and interesting. i don't have much anyway. hehe. but some i have are good. i'm planning my MA thesis to be abt contemporary gay lit but i still do not have a suitable framework. but of course, that's an overshare. haha. what i was meaning to say was, other materials may change my notion of "gay lit" and its contemporariness. that's it. anyhow, i am adding you to my blog list and i hope to go over your blog again soon. tc.